The battle for Karnataka infused immense volatility in the Markets as the benchmark NIFTY50 moved over 120—odd points on the either side before ending flat losing just 4.75 points or 0.04%. The possibility of a absolutely majority of the BJP fuelled a rally in the Markets with NIFTY trading over 115-points up from its previous close. However, the second half wherein the possibility of a hung assembly became evident, the NIFTY pared all of its recovery to end flat. With this political even behind us, and if we inspect the structure of the Markets purely on technical terms, we see that the NIFTY has pushed itself again for some consolidation. As we approach Wednesday’s trade, we see a quiet start to the trade. We are also likely to see volatility remaining ingrained in the Markets. Any slip below 10785 will push the Markets for some prolonged consolidation in the near term. The levels of 10835 and 10890 will act as resistance levels for the Markets. Supports will come in at 10780 and 10710 zones. 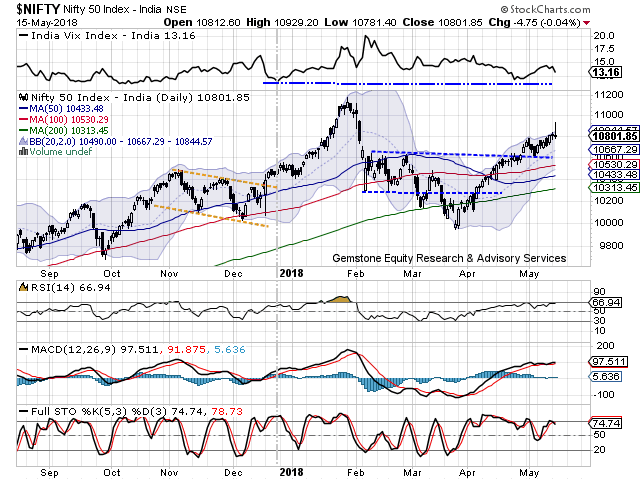 The Relative Strength Index – RSI on the Daily Charts is 66.9352. It remains neutral and does not show any divergence against the price. The Daily MACD still remain bullish while it trades above its signal line. On the Candles, a long lower shadow occurred. With this formation occurring after an up move it can potentially stall an up move and can push the Markets into some consolidation. The pattern analysis saw the Markets failing to break above the 10785 mark. 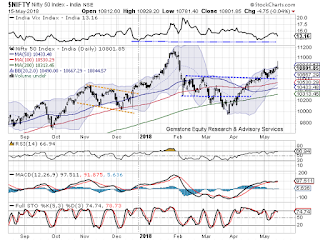 At one point with the Markets trading well above the 10785 mark, it had given a breakout but this was not sustained as the NIFTY pared its gains in the second half of the trade. Overall, though NIFTY attempted a breakout above the 10785-mark, it is likely that it takes some more time to confirm this. The NIFTY has most likely pushed itself again for some more consolidation. If there is any significant slip below the 10785 mark, some more weakness is likely to creep in. This being said, with the structure on the Charts remaining intact, pain, if any, will remain more visible in the broader Markets than as compared to the frontline Indices. We recommend remaining light on positions and maintaining a cautious view on the Markets. We also recommend utilizing such consolidation dips to make select purchases in the quality stocks. Short positions were seen being added in stocks like NATIONAL ALUMINUM, CG POWER, NCC, TATA MOTORS, ASHOK LEYLAND, BEL, ITC, PFC, TATA MOTORS, INDIABULLS HOUSING FINANCE, VEDANTA, NBCC and AXIS BANK.